El Greco (the Greek) is considered one of the greatest of inspired visionary artists. A native of Crete, he first worked in Italy before settling in Toledo, Spain, where he had a successful career with major commissions from both the Church and the private sector. The Repentant Magdalen bears the artist's signature in Greek and is believed to have been painted around 1577, shortly after El Greco's arrival in Spain. The elongation of the figure and the dramatic sky, hallmarks of his style, were to become even more pronounced in his later work. 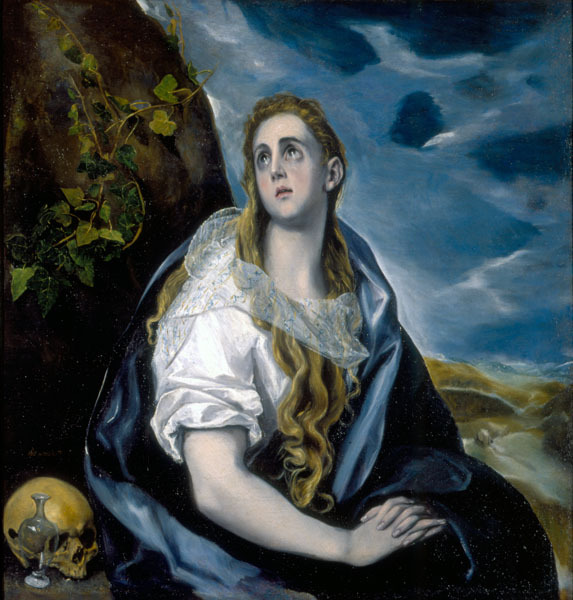 Saint Mary Magdalen was a favorite subject of El Greco's and one he returned to again and again. Here she is depicted as a repentant prostitute living the life of a hermit, her contemplation of eternal life after death symbolized by her dramatic, upward glance and by the skull at the lower left. Standing next to the skull is the Magdalen's most common attribute: the vase of ointment that she carried to Christ's sepulcher.